This is my very first book review. I don't know what's the 'correct' way to do it so I'm just gonna try to do my best. I’ve always admired people who write reviews because it’s something I find really hard to do, expressing my feelings/point of view towards things is not really one of my strong features... But I read a lot of books and I want to express how I feel about the stories I read and their characters. 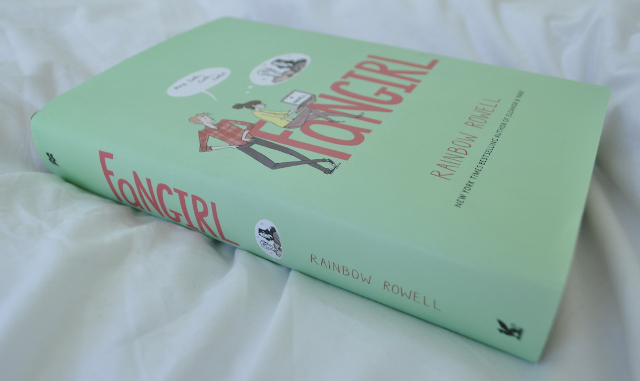 So today I'll share my thoughts on Fangirl by Rainbow Rowell. Cath is a Simon Snow fan. Okay, the whole world is a Simon Snow fan... But for Cath, being a fan is her life—and she’s really good at it. She and her twin sister, Wren, ensconced themselves in the Simon Snow series when they were just kids; it’s what got them through their mother leaving. Reading. Rereading. Hanging out in Simon Snow forums, writing Simon Snow fan fiction, dressing up like the characters for every movie premiere. Cath’s sister has mostly grown away from fandom, but Cath can’t let go. She doesn’t want to. Now that they’re going to college, Wren has told Cath she doesn’t want to be roommates. Cath is on her own, completely outside of her comfort zone. She’s got a surly roommate with a charming, always-around boyfriend, a fiction-writing professor who thinks fan fiction is the end of the civilised world, a handsome classmate who only wants to talk about words... And she can’t stop worrying about her dad, who’s loving and fragile and has never really been alone. For Cath, the question is: Can she do this? Can she make it without Wren holding her hand? Is she ready to start living her own life? Writing her own stories? And does she even want to move on if it means leaving Simon Snow behind? I had really high expectations for this book. I had heard nothing but good things about it. I mean just the name says a lot about me so it was only a matter of time that I got to read it. I was not let down, I really really loved it. I couldn’t stop reading it. To be honest, I had to force myself to stop reading and go to sleep one day. 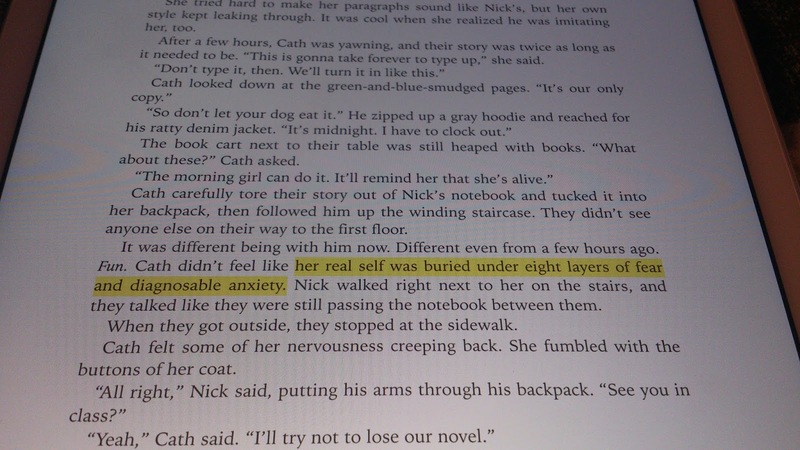 It’s the first book by Rainbow Rowell and I was amazed. Amazed by how real the book felt. 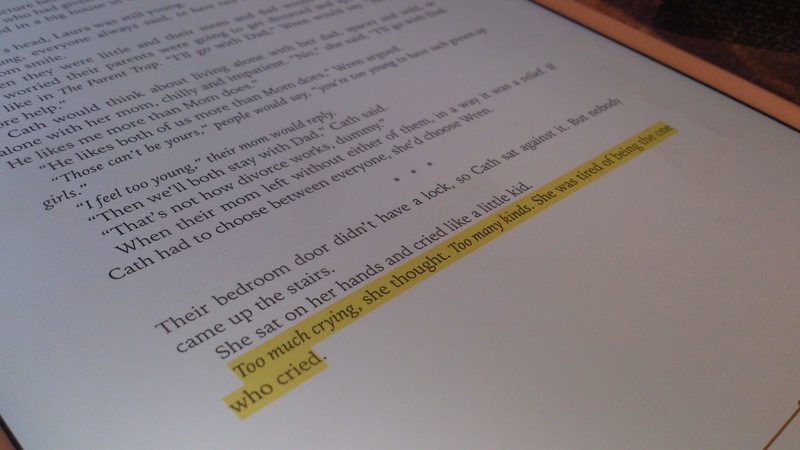 I believed all the words the characters spoke, the environment and everything. It felt like real life, if you know what I mean? Probably what I liked the most is that I could relate to Cath in a lot of things: she’s in her first year of university, she has social anxiety, fanfiction is part of her life (though she writes it and I don’t, I just read it from time to time), she is a huge fan of something, she spends a lot of time in her room, she worries a lot and as she puts it she is: “not good at boy-girl/person-person stuff”. The book is written in Cath's POV and sometimes I felt like I was Cath, literally, I was like: THAT'S ME! Another thing I liked is the characters' development during the story and how that makes you feel towards them. Don’t hate me for this if you’ve read the book but at first, I didn’t like Levi that much, I don’t know why I just wasn't into him. But oh boy that changed as I kept reading, he grew on me and I completely adore him now. He's so cute I can’t handle it. There’s one thing I didn’t like and it kind of bothers me a bit. Maybe more than a bit. And it’s how the book ends because it’s sort of an open ending. I’m not going to make any spoilers but I just wished it hadn't ended just like that, I needed more. I want to know what happens with certain things, maybe small things that most people don't care about but I do. I just can’t imagine it myself and it’s kind of frustrating. But if you’ve not read the book I don’t want you to not read it because of this. The book is really worth reading. It’s so so good and you will fall in love with the characters, you will have a lot of feels, especially if you are a fangirl. I think we all have that one band/singer, tv show, book, film or whatever it is that we love and appreciate a lot, maybe we are even obsessed with it, so anyone can relate to this book in some way. Another thing I want to say, though it’s not really that relevant, is that I’m really proud of myself as it’s the first book I read in English (not counting the short 70-100 page books we had to read in school). I mean I do read other things in English but I had never finished a book written in this language so yup I'm happy about that. Have you read the book? Did you like it?